C# Sharp Exercises: Compare three versions of the letter "I"
Write a C# Sharp program to compare three versions of the letter "I". The results are affected by the choice of culture, whether case is ignored, and whether an ordinal comparison is performed. 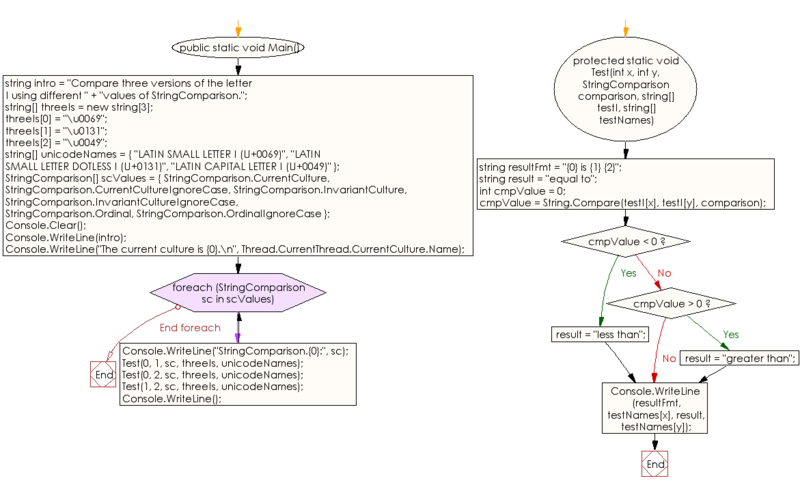 // System.String.Compare(String, String, StringComparison) method. "LATIN CAPITAL LETTER I (U+0049)"
// Determine the relative sort order of three versions of the letter I. Compare three versions of the letter I using different values of StringComparison. The current culture is en-US. Previous: Write a C# Sharp program to compare two strings in following three different ways produce three different results. Next: Write a C# Sharp program to demonstrate that CompareOrdinal and Compare use different sort orders.